Asthma is a common respiratory disease caused by an inflammation of the small air passages of the lungs, called bronchioles. The etymological sense of the word asthma comes from the Greek word meaning panting, i.e. difficulty in breathing. 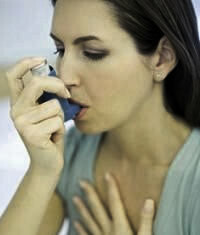 Bronchitis and asthma are different diseases, which are often confused by laypeople. It is very common to see people calling bronchial asthma, as both terms were synonymous. Similarly, terms such as bronchial asthma and allergic bronchitis are also often used to describe clinical presentations that are actually asthma.